It’s a football Friday! I’d like to thank you for visiting SportsFormulator.com. Things are going well and we appreciate your feedback and that you’re checking out our new features this football season. Our Pick ‘Em contests are going well with record numbers of entries every week. If you haven’t entered yet, pick this weekend’s college football and NFL for chances to win prizes! Our Survivor Pool Picks feature is getting a tremendous response. We’re 2-0 on the season so far and look to keep it going this weekend. We’ve got our full NFL and College Football cards up in the Pick Shop. 7 College Football picks and 3 NFL. You can buy by league or get them all together. The picks are guaranteed to be profitable or you get a refund! We’ve also got $5 Friday picks in both the NFL and college football. These individual picks are just available today so take advantage now. 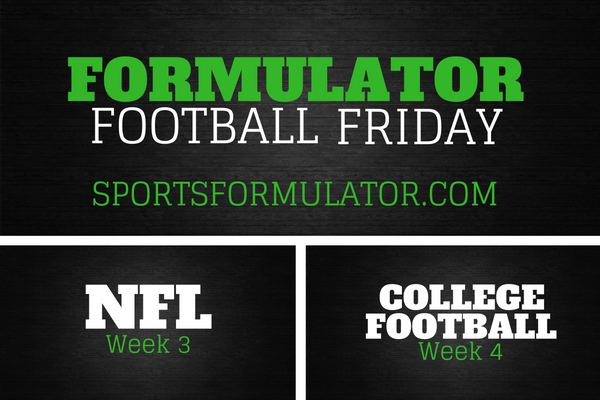 I want your input on SportsFormulator and would appreciate if you could answer 5 quick questions here. Bill Belichick is the greatest NFL coach of all time. Cheating aside, his ability to continually win regardless of the 11 players that line up on a given play is remarkable. Using his third string QB, Belichick guided the Pats to a win over a playoff team last night. Another profitable weekend with our NFL picks! We went 2 for 3 cashing tickets again keeping us at 67% ATS on the season. Broncos at Bengals is the big game in the NFL this weekend. The Bengals lost in Denver on Monday night last season that ended up giving the Broncos home field throughout the NFL Playoffs. The Bengals will have Andy Dalton for this one though and playing at home will want to bounce back from a loss in week 2. Can the Seahawks and Rams score this week? They’ve both struggled to put points up this season. Last week they combined for 12 points in the game with the Rams winning 9-3. The two games I’m most interested in this weekend are the Raiders at Titans and Ravens at Jaguars. These are teams that have been up and down this season so can they show their potential and win this weekend? Get week 3 NFL predictions and power rankings. If you haven’t made your picks yet, make them now. Some good conference match-ups in college football this weekend. Tonight, USC visits Utah. These have proved to be tricky games in the past for road teams. Michigan State comes off of an impressive road win at Notre Dame to host Wisconsin. The Badgers have flown under the radar since a big win over LSU to start the year. Are they ready to take a big game on the road? I’m most interested in the Arkansas at Texas A&M and Oklahoma State at Baylor this Saturday. A&M has looked good this season and Bret Bielema’s Razorbacks are always a tough game. This is a game that’s going to go to the wire. Baylor gets their first test of the season as the Cowboys of OSU come to town. For Jim Grobe, it’s a big step up in competition for his team. Okie State rebounded last week from being robbed of a win against Central Michigan. The Cowboys are going to keep this game close. Get our week 4 college football predictions and power rankings. Check early Sunday morning for my new Formulator Forward column, where I review the previous week of college football and predict the next week’s point spreads for big games.